This seems to happen quite often, especially with those wh o come to Japan straight out of college. Having never returned for a significant amount of time in the decade I've been living in Japan, I may not be the best person to give advice, but I'll go ahead anyway. 2. Seems like these days aren't exactly the best to be hunting for a job. I suppose it depends largely on what you wanna do. That said, Japan can provide a respite from the rigors of searching for a work in a hostile climate. Maybe use the English teaching as a bridge to doing something you're more qualified to do, but over here. You'd be surprised how much you can do with medium-level Japanese. Don't let language/ other worries interfere. That's really all I got at the moment, but I have lots of thoughts on the subject. Thanks Jljzen. I'm not sure what my plan is right now, but I'll take that into consideration. I think I'd like to go back to Japan and might be open to living there long term, but I'd have to have a decent job (maybe an American firm or government or something). It's just hard to say anything for sure right now. Sammer - LDR is tough, man. That said, power and good luck to you. As the end nears, I think you need to assess how you feel about each other and what your chances are. Honestly I have regrets about how my LDR ended. If you feel like you really love her and could make it work, seriously consider that. Thank you for your words, I will certainly consider all the options that we have. I was kinda in a similar predicament about 2 years ago until I picked up my current obsession, photography. Have you thought about picking up any additional hobbies or interests? that might help you network more and give you enough change to spice things up a bit. I've been doing that for the past year or so and probably going to take it a bit further pretty soon. My life has been going consistently upwards since then. 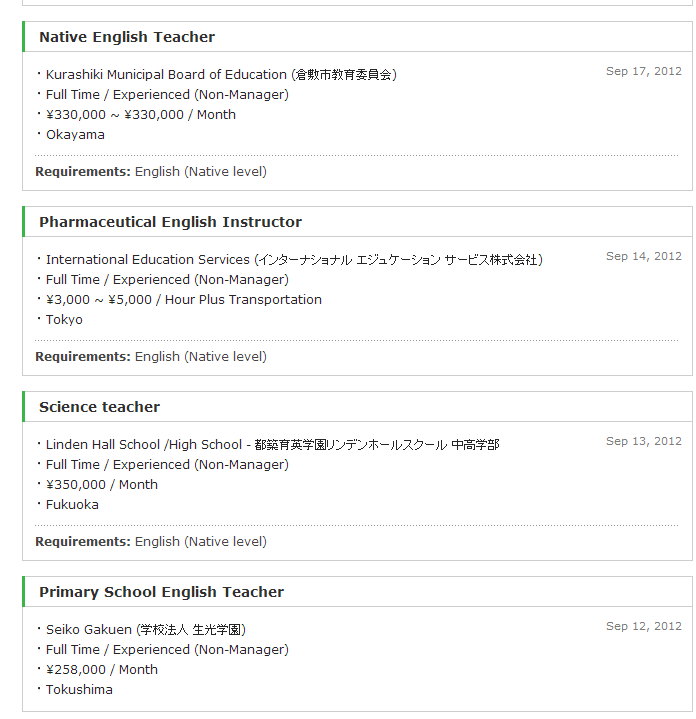 Hey there, don't have much advice other than looking for a Japan or Asia related job to work as a bridge between your experience and other jobs in the work force. I feel like reading your posts are like a peek into my future. We have had very similar paths as far as Japan is concerned, so I feel like I'll be in the same position when I go home next year. Sorry if that wasn't very helpful, but know that you're definitely not alone! Good luck! Sammer - No problem, man. Feel free to drop an email or a comment if you want to talk about it. Tom - Thanks for commenting. Yeah, I have considered that, and I have been getting involved uh, er...Japan and Japanese language-related stuff. It seems kind of difficult to find cheap or free ways to get involved in a lot of hobbies. For example I would like to take some cooking classes or something, but those seem to be pretty...not cheap.